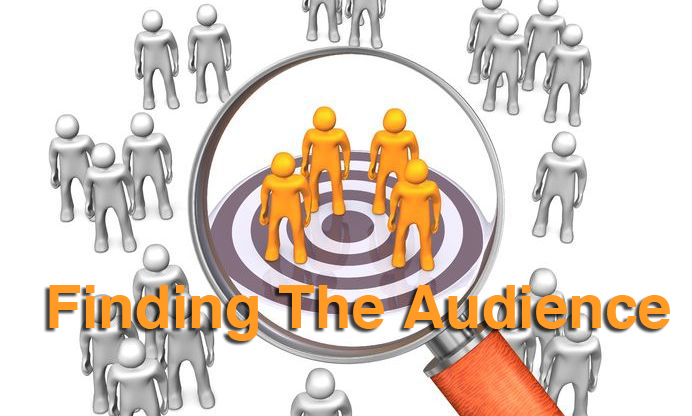 One of the first things I tell prospective clients is that the first step they need to take is to research which social media platforms their target audience is using. Just because platforms like Facebook and Twitter account for the lion’s share of online social activity does not mean that they are the automatic go-to solution. It’s always vital to zero in on the online spaces where conversation pertinent to your brand is occurring. For some brands political affiliation is a key factor. Whether liberal or conservative, it pays to know where those receptive to your message are gathered. 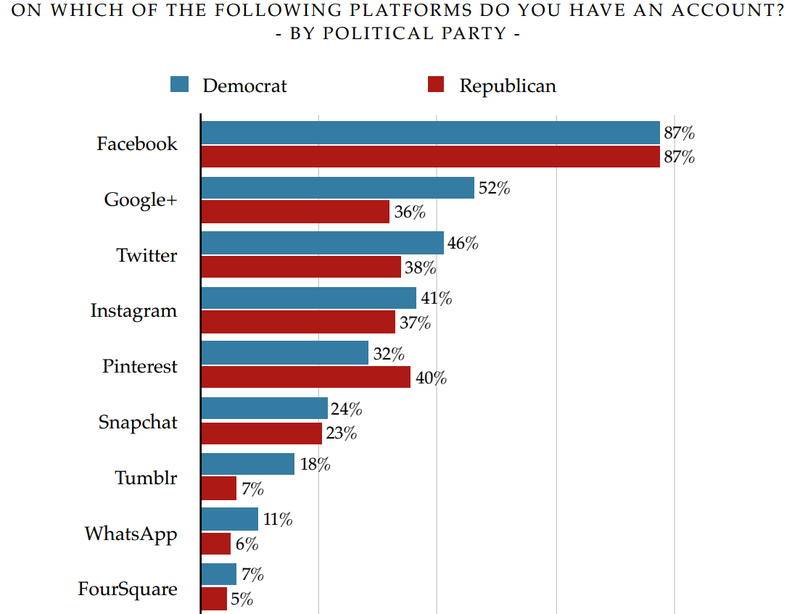 These brands should be overjoyed with a new survey by the Harvard Institute of Politics that shows, among other things, that in the age group surveyed, Pinterest leans heavily Republican, while on Google Plus and Twitter, Democrats are most active. The poll, conducted from March 22 to April 4, asked 3,058 Americans, ages 18-29, which social sites they preferred to use. The margin of sampling error was two percentage points. So let’s take a look at some of the key facts noted in the report. The first item of note is that the use of social networks was up across the board, with Facebook at 84 percent, Google Plus at 44 percent, Twitter at 40 percent, and Pinterest at 33 percent. While the numbers are hardly surprising, it’s good to have an idea of current penetration when figuring out your marketing mix. Over the last couple of semesters we’ve seen Twitter go more mainstream, [among high school students] it’s tied with Facebook as the one social network that young people can’t live without, that’s a significant sign relative to just a couple of semesters ago. In the land of 140 characters, we found that 13 percent of Twitter users said they had used the site to advocate for a political position. As you can see, political activity is alive and well on social media. For brands attempting to reach their target audience through common ideology, the next few numbers should prove useful. So, from what Harvard tells us Pinterest is the only platform at this point in time where we see a clear Republican dominance. On Facebook, Republicans and Democrats are active in equal numbers. The rest of the platforms get more usage, sometimes a lot more, from those who identify as Democrats. Identifying where the conversations are is one thing, but alone it is useless data. The observation of trends is also vital for navigating these waters. Meg Panetta and Jenny Gao over at HarvardPolitics.com recently looked at one trend I’ve written about here — the davaluing of Facebook among the millennial generation. Millennials’ use of Facebook is declining. Thirty-seven percent of poll respondents reported using Facebook less in the last year, while only 16 percent reported using Facebook more. This decline might be partly fueled by the changes to the site over the past year. After Facebook implemented changes in its algorithms which track viral trends and better target site material to individuals, 35 percent of poll respondents stated that these changes made them less likely to use the site, whereas only 7 percent of respondents felt that the changes made them more likely to use the site. Although a majority (58 percent) of young Americans feel that recent changes in Facebook will not impact their site usage, the stark gap between those deterred by the changes and the minority pleased with them attests to a growing discomfort with Facebook among young millennials. While these numbers do not sound a death knell for Facebook — not even close — they do point to the future of online discussions being less dominated by Facebook. I’m sure that many people are paying attention to these new numbers as we roll closer to the next election cycle. A wide variety of businesses and consultants make their living off of the political process, and all of them will want to reach sympathetic ears.